1969: Death of Ralph J. Canine, first DIRNSA. 8 March 1969: Death of Ralph J. Canine, first director of the NSA. Ralph Canine was inducted into the NSA/CSS Cryptologic Hall of Honor in 1999 - read the full Hall of Honor entry about his career and accomplishments via the link at the bottom of the page. Hall of Honor excerpt: Lieutenant General Ralph J. Canine, NSA's first director, is known today as the Great Unifier - the man who, almost single-handedly, forced cryptologic unification on the Services. 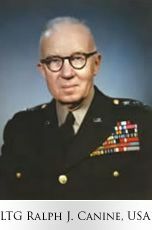 His term at NSA, from 1952 to 1956, became the crucible for cryptologic centralization. He departed the Army and NSA a figure of mythic stature. Had Canine not been the director, NSA might not have survived the end of the decade.